Surrogacy is a very good option for childless or infertile couple to have a child of their own. But the process is not at all simple and is subjected to a lot of risks. Hence, precaution is a must. One will have to make sure that both the parties are positive about the happenings. In this complicated process there are 10 things a couple needs to consider before opting for surrogacy. Get recommendation from an IVF doctor if you are allowed to do surrogacy. 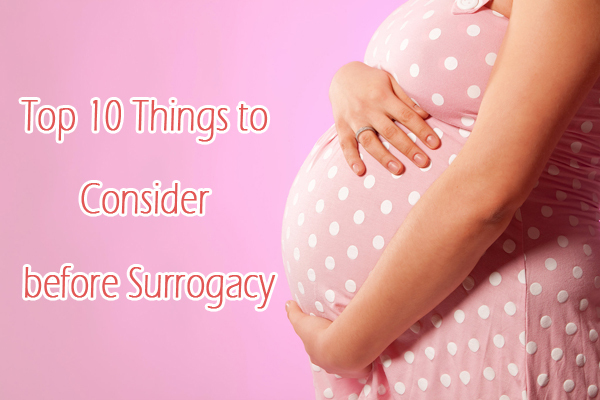 Keeping your good figure or a stressful high-powered job cannot be valid reasons to opt for a surrogate mother. Most IVF doctors out there only work with those couple work with serious medical reasons. Psychological issues can be included as they are considered as medical reasons too. 2. Psychological counseling and evaluation for the surrogate and partner. You will need to understand the psychology behind the surrogate mother. Questions like has she done surrogacy before, and what went wrong or right that she feels the need to do it again has to be answered. She will have to understand that the couple will be involved in the pregnancy and might have a difference of opinion on pregnancy care and treatment. Talk out in advance how involved will she allow the couple to be. Above all you need to get a written psychological clearance on your surrogate mother. Psychological counseling is very important for the couple. You will have to find answers for yourselves for certain questions like can you allow someone to carry a child for you? There are women who try to control every aspect of the surrogate’s life and later on fall into disputes. You will have to discuss this thoroughly with your counselor. 4. All parties should complete a common surrogacy questionnaire. The questionnaire will carry questions on mental illness, hospitalizations, genetic illnesses, prior marriages, prior children, health status, marital status, bankruptcies and legal judgments, prior pregnancy history, infertility history, etc. 5. Understand the legal status of surrogacy law in the state where your surrogate mother lives. Get independent legal consultation about the lawsuit of the state your surrogate mother lives in. If you are in doubt about your parental rights, do not take it to the next step. If she wants to deliver in another state, do not abide by as she could have a premature delivery. Both the parties should have independent legal counsel to represent them. They must sign legal contracts before approaching towards any medical procedure. 6. Openly discuss and document everyone’s expectation of the surrogacy relationship. Discuss openly the role of each party in surrogacy. Check if they can really do what is expected of them. Also discuss well in advance the kind of relationship they would want after birth. A counselor can guide the parties in this aspect. The idea behind surrogacy is to give an infertile couple something that they are deprived of. If a long-term relationship is expected by any party, decision should be taken in the best interest of the child. However, the couple should not agree to continue a close relationship after birth though. Discuss well in advance if you could afford to pay for pregnancy. You will have to be okay with the high-risk involved like premature birth and miscarriage. 8. At least one parent should be biologically connected to the child being conceived. If both egg donor and sperm donor are needed with a surrogate mother, make yourself prepared for a complicated relationship both legally and psychologically. The psychological counseling should not stop at any time during pregnancy or for at least two months after birth for both the parties. 10. Selecting the right agency. Do a very good ground research. And always work with reputable surrogacy agencies.